The VIEW brings portability & capability together in this user-friendly, flat panel CCTV with distance, intermediate & desktop magnification. 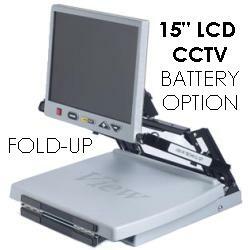 Carry it like a briefcase from room to room or across town; the VIEW is completely collapsible with an adjustable height monitor allowing plenty of room for writing and task work. The camera focuses quickly and turns 360 degrees horizontally / 240 degrees vertically for viewing everything from the clock o�n the wall across the room to your newspaper o�n the x-y table.